Brian Dressel, a 13-year member of the Brownton City Council, submtited his resignation Monday night. Dressel has sold his home in Brownton and intends to move to Hutchinson. The city of Brownton’s estimated $8.4 million comprehensive street and utility project is finally going out for bids. The City Council heard Monday night that the United States Department of Agriculture (USDA) Rural Development program had approved the plans and specifications. John Rodeberg with Short Elliott Hendrickson (SEH), Inc., the city’s engineering consulting firm, said bids are due Feb. 28, and likely will be awarded at the April 3 City Council meeting. “Construction probably won’t start until May, so we’ll have time to meet with the contractors after the bids are awarded,” said Rodeberg. But like the plans and specifications, Rural Development will have a role in the awarding of the bids. The council is hoping that will not delay the process any more. Rural Development is providing funding for the project through grants and low-interest, long-term loans. Rodeberg also said that SEH hopes to host an open house in the middle of March to review the plans with residents, as well as expectations for construction. • Accepted the resignation of Council Member Brian Dressel, effective as of the March meeting. Dressel has sold his home in Brownton and will be moving to Hutchinson. 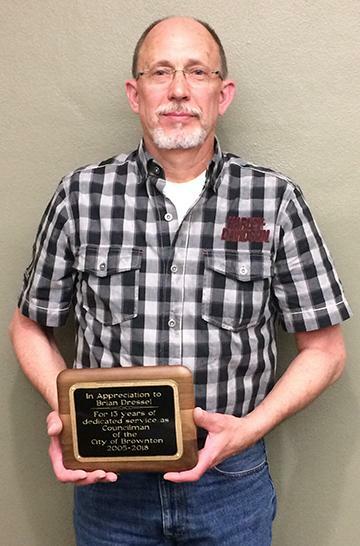 He was presented a plaque for his 13 years of service on the council. A replacement will be appointed in March to fill out the rest of the rest of the year; Dressel’s seat will be up for a special election in November. For more from the council meeting, see the Feb. 7 print edition of The Chronicle.